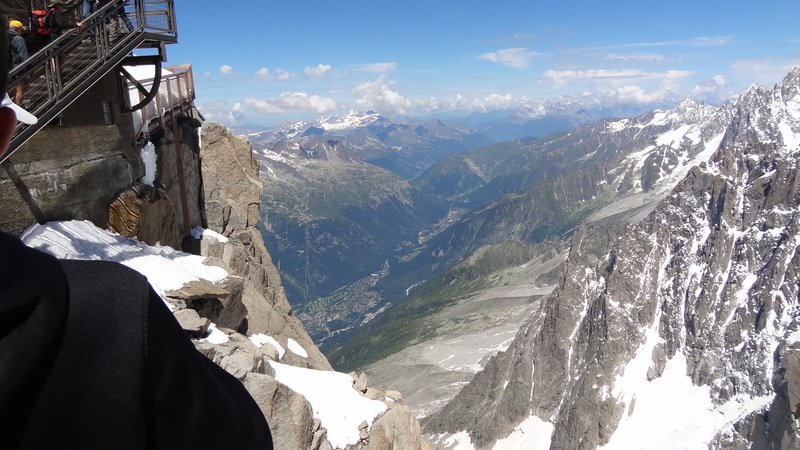 I am in Chamonix (it is Wednesday the 16th July) on the first day of my attempt to climb Mont Blanc for the first time. Mont Blanc is a tough mountain by anyone’s definition, and stands at 4,810m, the highest mountain in Western Europe. Permanently glaciated and snow covered, there are quite a few routes to the top, and all involve considerable care and effort. Our route will be via the Grand Couloir up to Dome du Gouter and via the Bosses Ridge, and will commence this coming Sunday. 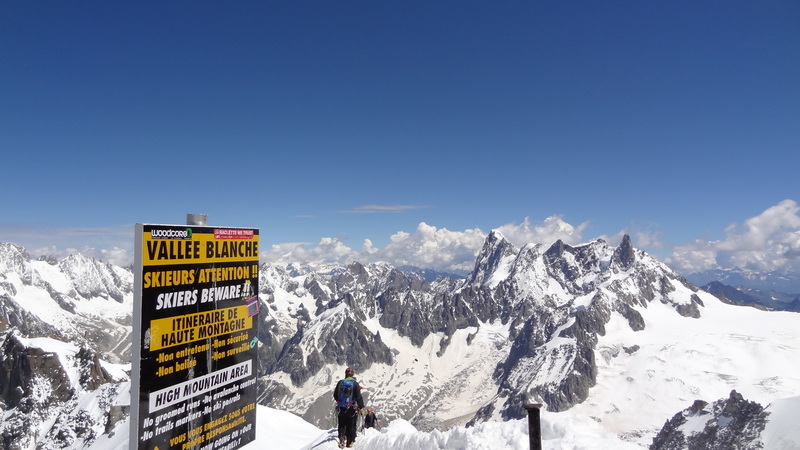 The trip is run by a company called Mont Blanc Guides, an English run business based in Chamonix, and Mont Blanc is all they do. I was immediately impressed (I referred to this in an earlier blog post) at their responsiveness and attention to detail, and they got my vote right away. It’s not a cheap trip by any means (about £2,000 for six days excluding travel to and from Chamonix), and much of that is eaten up by the cost of guides. The French insist upon a 1:2 guide to climber ratio on the mountain, which you have to say makes sense – it is sadly the mountain which probably kills more than any other. 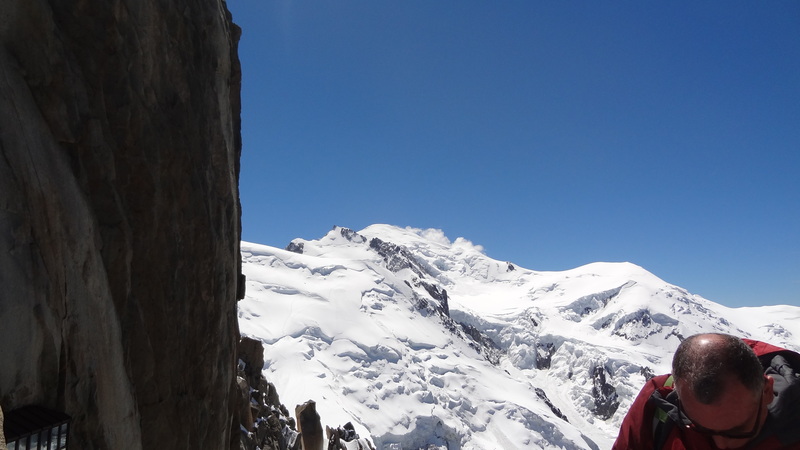 Day one was simply a day to travel and meet up with the guides and get settled into the accommodation in Chamonix. 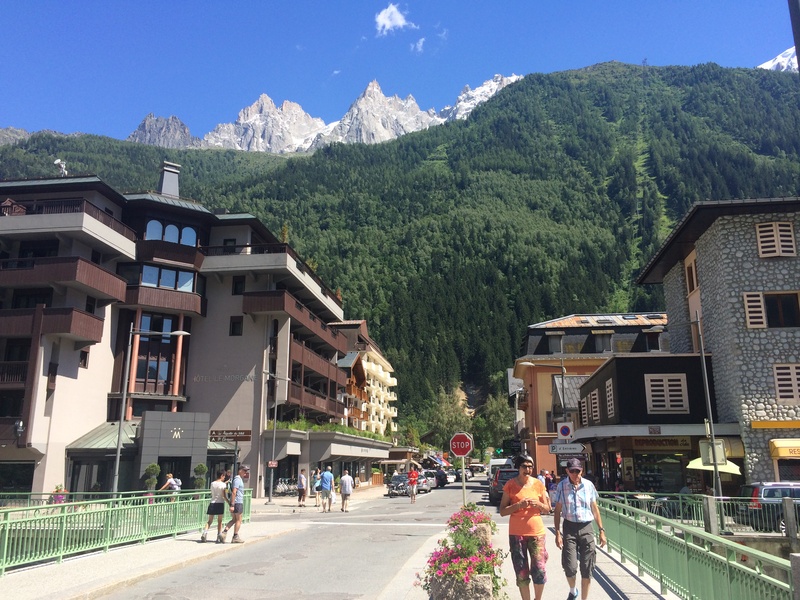 The main events happen on days 2 to 7, spilt into three days in Italy acclimatising and doing glacier travel, and then three days to do Mont Blanc itself. 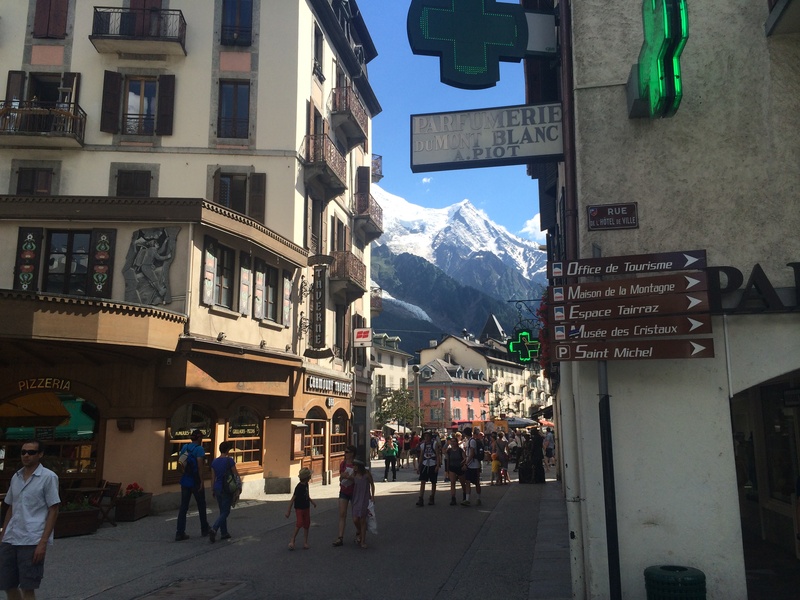 I got into town early (about 11am) after a seamless flight from Luton to Geneva, and then a minibus to Chamonix. 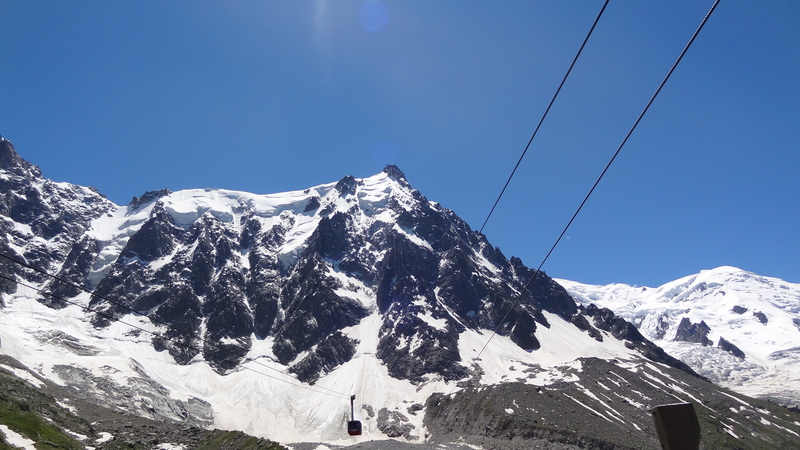 As I had until 6.30pm to do the meet ups, after dumping my bags I headed straight up the cablecar to the Aguille du Midi, which at 3,842m has to be about the highest cable car station in Europe. It is incredibly dramatic, and a great place to just visit on foot, which so many people do (I queued for around an hour in the middle of the day, along with heards of ubiquitous Japanese tourists. The return journey was over £50 too, so they are making a bunch of money in the summer months that is for sure. The cable car ride was amazing and the skies cloudless and crystal clear. Mont Blanc eventually came into view like some brooding behemoth ready to squash the whole valley below it. It really is a staggering mountain, and such a complex one too. ….and stepping out at the top at 3,842m. That’s the town nearly 3 vertical kilometres below. 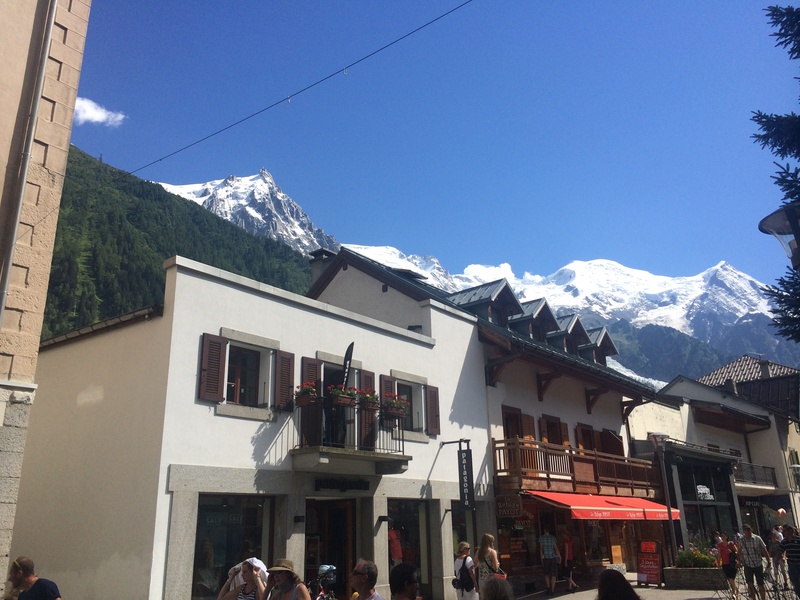 After I got back down I had a bit of a wander around Chamonix, and realised what a really nice little town it is, and figured that spending more time here would be a good thing in days to come if there was time. And the ridge leading towards the Grand Couloir looks menacingly towards town too. When back to “The Castle’ (the name of the in the evening, I got to meet the rest of the team that I’d be travelling with, and also our guides. We were Colin, Mick (who was also my roomie), Stuart, Rich, Katya, David, and Jonas, plus me, making 8 altogether. All were from the UK, except Katya from Moscow, and Jonas from Norway. Oh and Colin lives in Qatar, but is from Glasgow. Everyone got along really well it seemed, and I knew it would be a good group, as is in my experience always the case when like minded people come together on trips like this.